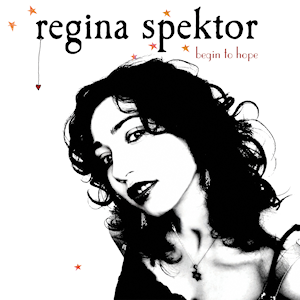 Apparently Regina Spektor started out as a classical musician with plans only to play classical music. Then she was introduced to hip hop music and changed her whole musical style. How she ended up with her indie/folk/alternative/singer-songwriter style from all that, I’m not entirely sure. But she released her first major label album, Begin to Hope, in 2006 and was certified Gold by the RIAA (Recording Industry Association of America). She did release three albums prior to the release of Begin to Hope, but they were self-released. What I like about “Fidelity” is the fact that from the first second of the song, it’s got you tapping your foot to the steady beat. I don’t think you could categorize this song as a “happy” song, given the fact the chorus is her singing “it breaks my heart” four times in a row, but the beat and the pizzicato orchestral strings give the song a bouncy feel which makes it feel optimistic and upbeat. But then in the second verse, Spektor sings a lot about hypothetical “suppose” situations that deal with not being in love, which indicates that in that moment she is in love. For example, she sings “suppose I never ever met you/Suppose we never fell in love.” Because she’s adding the “suppose” to the lines, she is indicating that she is in a loving relationship; her hypothetical life is one where she never meets her love. Now, we look to the bridge where there’s a third element that is added of where her love has left her. At the bridge, she sings that her friends tell her it will get “better.” Why would the situation need to get better if she was with the person that she loves, the person who should make her so happy (do you know anyone who is in love with someone who doesn’t make them happy?)? The great thing about music, though, is that you can interpret it anyway you want. You don’t have to take “Fidelity” as a song about heartache or loss. I don’t want to. To me, the bouncy energy and the lyrics in the verses indicate the feeling of falling in love for the first time. And that’s perfectly okay. The words and the music say something, but if you hear it a different way that is awesome.